Search Results for "inner tube"
A cute little girl learns to swim in the new backyard swimming pool with the help of her older sister in 1967. Man sitting in inflatable ring towed by a boat in the water and recording himself with Go Pro camera. He making faces to the camera. People inner tube on a river. 1930s: Swimming pool. Man dives underwater. Man spins girl's inner tube. People sit beside pool. Mountains. 1930s: Swimming pool. Platform with ladder. 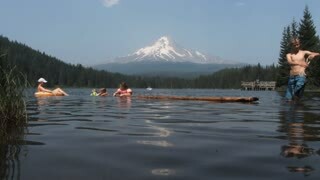 Little girl swims in inner tube. People sit by pool. Mountains. A grandfather blows smoke through foam rubber and stretches a rubber-band and comments on an inner-tube with his grandson in the basement of his home. This slow motion video shows a young attractive caucasian woman floating in a pool in a bright colored pool toy / inner tube. Father and daughter sliding down on a Public Park Slide from their point of view. 1930s: People in bathing suits stand by beach umbrellas, man walks out of building. People sit on boat in water. Man pushes long, thin boat out to sea, people paddle. Boy runs wearing inner tube. 1940s: Kids on inner tubes swing balls on strings at one another in pool. Kids hit each other with balls on inner tubes. 1940s: Men acrobatically jump off diving board into pool. People watch divers from poolside and balcony of motel. Kids on innertubes in pool. 1940s: Kids knocks other boy off inner tube in pool. Man swims backward while holding barbell. Men dive acrobatically off diving board. Boat Water Tow Fun / Aerial shot of a boat towing a inner tube across the lake close to shore. 1940s: Women floating with inner tube in ocean. Shots of women swimming in ocean.